This week I would like to present you an excellent work by Perry Benedik on the game of Sic-Bo, an e-book named: 14 Months at the Sic-Bo Table, as a result of his extensive research on the game in finding reliable and low risk strategies in order to improve your game tremendously. Just as the title implies, �Fourteen Months at the Sic-Bo Table� by Perry Benedik (PerryB) contains a database and forensic-like analysis of more than 46,000 actual Sic-Bo rolls that were recorded by the author at live-play casino Sic-Bo tables from September 25, 2003 to November 25, 2004 . In addition to suggesting some profitable, low-risk, short-run flat-betting strategies (without any steep and stressful progressions), �Fourteen Months at the Sic-Bo Table� also provides an opportunity for the novice, as well as the experienced Sic-Bo enthusiast, to perhaps learn some very useful facts about the game�s behavior. 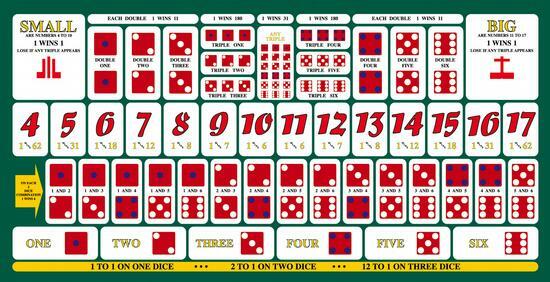 While only �Big� and �Small� Sic-Bo decisions were recorded, �Fourteen Months at the Sic-Bo Table� provides a database of actual results that can be used as a system testing-ground not only for Sic-Bo, but also for any even-money betting strategies at other casino games, such as Baccarat, Craps, and Roulette. It can also be enjoyed simply as an informative, long-term study of the game delivered in a well-written and entertaining way. You can click here to see how Sic-Bo is played and why Sic-Bo Big and Small bets have a 2.8% house edge, equivalent to single zero Roulette. Some of PerryB�s own written articles on gambling that appear in �Fourteen Months at the Sic-Bo Table� were published on www.dicesetter.com, and quite often leave the reader with some serious food for thought about how to approach the difficult goal of coming out ahead at the casino. As an active professional musician since 1968, he learned long ago that technical skill alone is not all that it takes to make good music. Experience has taught him that playing fewer notes not only makes for fewer chances to make mistakes, but often produces a better-sounding tune. He has also seen for himself how a similar �less is more� approach usually produces better results at casino gambling as well. In �Fourteen Months at the Sic-Bo Table�, PerryB�s attention is focused on the old Oriental �three-blind-dice� game, where no one ever seems to win, and the house usually takes all the money. Well, he has certainly done his homework on this one. Through extensive testing, he has picked up on the consistent and recurring behavior of certain aspects of the game. These were developed into some down-to-earth betting methods that are not only easy to learn, but can actually reduce the casino�s edge. Certain situations have even proven to be to the bettor�s advantage, with an overall winning flat-bet performance of more than 51%. The same strategies can easily be applied to all even money bets in Roulette, Craps and Baccarat. While purchaser-support is available, (email PerryB at: pbenedik@hotmail.com), �Fourteen Months at the Sic-Bo Table� is primarily intended for information and entertainment purposes. With that alone being well worth the price of admission, for only $70 U.S., no guarantees can be offered against financial losses that may be incurred by using any suggested betting strategies, whether due to improper betting application, bettor strategy-modification, or just plain bad luck. With your order, you receive a 22 page e-book, 273 pages of analyzed Sic-Bo results of 46,288 rolls, plenty of useful strategies, as well as some of Perry's famous articles.